George Stanner: What are you doing? Not up here. Get back down there. Jesus. Morons. Q: Does Gartley know that a demon has possessed the machine? 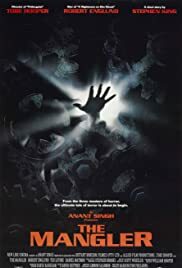 The Mangler is a decent,scary film.It aint Shakespeare,but it's a good way to pass some time.Based on on of my favorite Stephen King short stories,it has an interesting premise and some good performances,especially Ted Levine and Robert Englund.It's nice to see Tobe Hooper back in something like good form after so many dogs.6 out of 10.